Last night, it came to the internet’s attention that at 8:23pm, someone on Capitol Hill was hard at work editing the Wikipedia entry about lightsabers. This would be a totally understandable use of a congressperson or staffer’s time were it not for the fact that they were spreading lies. If you’ve spent any time at all on a Wiki page focused on Star Wars, then you’ll understand that they tend to be exhaustive and specific in their descriptions of various people, places, and things. While the unknown Star Wars lover on the Hill attempted to keep to that tradition, he or she got one very important fact about lightsabers wrong that might actually be of interest to more casual fans—given how much uncertainty there seems to be about how the balance of the Force will be altered by the events of The Last Jedi. For a long time, it was explained that the variations in lightsabers’ colors were due a couple of key factors. In the original Star Wars canon, it was established that kyber crystals naturally favored the light side of the Force and were able to establish something of a long-lasting relationship with the Jedi order, in which Jedi would periodically harvest crystals to construct their signature blue and green lightsabers. (Mace Windu’s purple lightsaber is a unique case of Samuel L. Jackson getting his way. Look it up.) Understanding that kyber crystals were a valuable and powerful resource, the Jedi took to more or less hoarding them for themselves, leaving very little left for others to use. 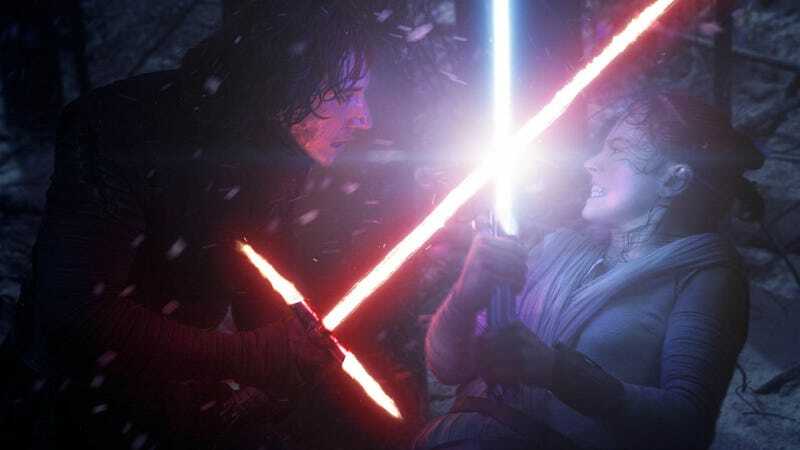 Red lightsabers originally were explained to be constructed with synthetic kyber crystals—which, despite being technically more powerful that their natural counterparts, were prone to catastrophic failure at some point in their lives. These crystals were favored by the Sith primarily because they could be created rather than harvested and, again, they made for lightsabers that gave off much more raw power. In the new official canon established in E.K. Johnston’s Ahsoka novel, however, synthetic kyber crystals are done away with entirely and red lightsabers are given a new origin. Ahsoka introduces the concept of “bleeding,” a process by which a Force-user attuned to the dark side takes a naturally-occurring crystal and floods it with dark energies tied to pain, suffering, and trauma that forcibly render the crystal red. Ahsoka’s signature white lightsabers are unique because she removes the crystals from Inquisitors’ weapons and cleanses them of their powerful dark energy. The process rids the crystals of their evil, but the fact that they’ve been corrupted and then rehabilitated leaves them unable to return to their once-natural blue or green color. In the current Darth Vader comic, it’s shown that Vader constructed his own red lightsaber through the bleeding process, infusing it with the traumatic memories of losing his mother, his wife, and being nearly burned alive to complete the process. All of this is a very long-winded way of saying that yes, a lightsaber’s color is a more than reliable judge of its wielder’s character—unless, you know, someone just happens upon one randomly and manages to fire it up. Even then, though, all you would really need to do is take a look at the person’s face to figure out which side of the Force they were on. If the face being illuminated by the lightsaber’s light is a nightmarish death mask of horror and madness? Well, then, you’ve probably found yourself a Sith.